Andy McGuinness, right, and Gareth Davies with titanium at IFA. 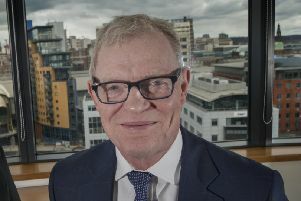 The decline in the oil and gas industry may have hit some, but two Sheffield metals firms in the sector are expanding into bigger premises and creating jobs. Independent Forgings and Alloys of Livesey Street, Hillsborough, bought 35,000sq ft of land and two buildings two weeks ago. Coda Architecture image of its planned extension at Howco. And Howco has plans to build an industrial unit on its Carbook Street site near Meadowhall. But while both firms are growing, they have different stories to tell. A steep fall in the price of oil has led to IFA focusing more on aerospace products, especially those made from titanium. Managing director Andy McGuinness said when oil was cheap airlines made more money and spent it on new planes. Over the last decade IFA has specialised in forging titanium ingots and recently hosted a 40-strong group of delegates from the Titanium Europe 2015 Conference. They saw the 1,500tonne press at work, as well as ring and hammer forging and ring rolling. Meanwhile Howco is to be given a major overhaul and extension after its best year in 2014, in a project led by architectural practice Coda Studios. The designs include a redevelopment of the Carbrook Street main entrance area and a new industrial unit on the site. Howco Group plc is a global distributor of raw material for wellhead and completion equipment to the oil and gas industry. Andrew Marwood, European operations director, said: “We have exhausted how we utilise our ground and building footprint and with ever changing market demands, we aim to exploit all available space, with the goal of increasing our warehouse area by approximately 22,000 sq ft.
With almost 30 years’ experience, the company has facilities in the USA, Canada, Norway, Singapore, China and Dubai. It processes steel, chrome molly, duplex, stainless and nickel-based alloys. Howco employs 180 in Sheffield. Last year it installed new CNC milling equipment, CNC lathes and purpose-built batch heat treatment furnaces, as well as extra sawing machines.